Snow flurries or light snow showers could start to break out across parts of the Shenandoah Valley as early as 4-6 AM with the best chance for precipitation late morning through early afternoon. A few leftover light bands could even continue into the evening hours...especially across the western mountains with upslope coming into play. Temperatures will be quite marginal throughout (above freezing for majority of event). This could be the case where lighter bands fall as a rain/snow mix while more moderate precipitation falls as plain snow. The far northern Valley has the better shot at seeing steadier precipitation and therefore a better shot at light accumulations. 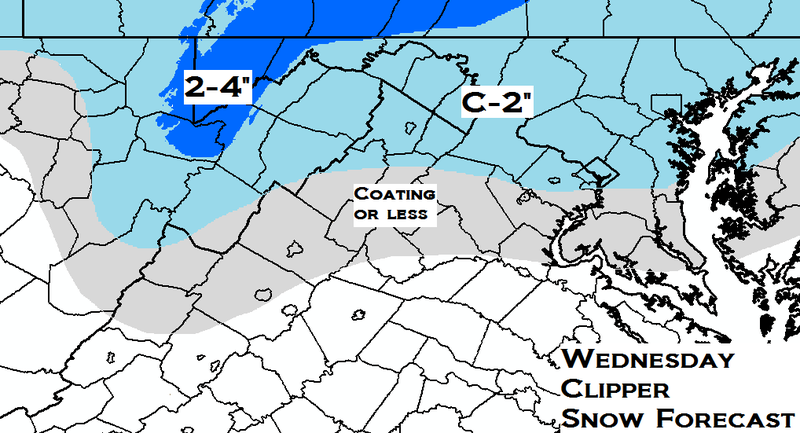 I went ahead and included the central Valley (Luray/Harrisonburg/Staunton area) in up to a coating because short range models show signs of a lone band developing this far south...not sure if this will come to fruition or not but something to watch. Will be a tough call for many school systems in the morning since best shot at snow comes after the delay/closing decision will need to be made. Below is my clipper snow accumulation map. As for the weekend system....thoughts haven't changed on that. You can find those here: http://noapologyvameteorology.blogspot.com/2015/01/after-midweek-clipper-watching.html.